Articles in category contain all recorded . The statements may need to be updated, removed or edited for perspective. Articles containing older statements are more likely to be dated. This is not a backlog; not all articles included in this category will need updating at this point in time. 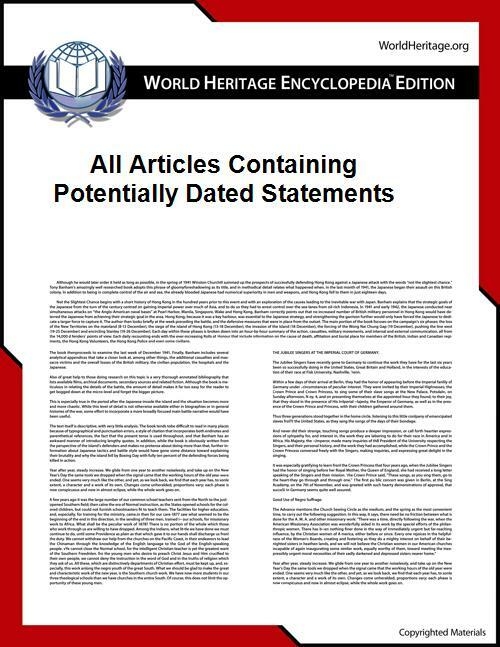 See also Category:Articles containing potentially dated statements which contains potentially dated statements ordered by originating date. Use to mark all individual statements that may become dated, this will automatically add them to the appropriate categories. Wherever possible, use to mark exactly when statements will need updating in addition to using . The current focus is on articles beginning with: . for details of dealing with statements that date quickly. for guidelines on using precise language when dealing with information that may date quickly. Category:WorldHeritage articles in need of updating and the accompanying template.